Although Bashir has denied a relationship with JI or terrorism. Bashir had a boarding school education for students Gontor, Ponorogo, East Java (1959) and alumni of the Faculty of the University of Al-Da'wah Ershad, Solo, Central Java (1963). Her career began with an activist Islamic Students Association Solo. Subsequently he became Secretary of the Youth Al-Irsyad Solo, was elected Chairman of the Indonesian Islamic Youth Movement (1961), Chairman of Student Islamic Propagation Institute, led a boarding school al-Mu'min (1972) and Chairman of the Organization of the Indonesian Mujahidin Council (MMI), 2002. Bashir Al-Mu'min boarding school founded in Ngruki, Sukoharjo, Central Java, along with Abdullah Sungkar on March 10, 1972. During the New Order, Bashir fled and lived in Malaysia for 17 years over its rejection of a single principle of Pancasila. 1972, Al-Mukmin boarding school founded by Abu Bakar Bashir with Abdullah Sungkar, Yoyo Roswadi, Abdul H. Qohar Matase Daeng and Abdllah Baraja. Boarding School is located at 72 South Street Ivory A, Village Ngruki, Sukoharjo regency, Central Java. Occupying an area of ​​8,000 square meters exactly 2.5 kilometers from Solo. The existence of this cottage was originally a lecture recitals activity noon in the Great Mosque of Surakarta. Membajirnya number of pilgrims make the preachers and the chaplain then intends to develop it into Madrasah Diniyah study. 1983, Abu Bakar Bashir was arrested together with Abdullah Sungkar. He was accused of inciting people to reject the sole basis of Pancasila. He also forbade santrinya do respect the flag because according to him it is shirk. Not only that, he even considered a part of the movement Hispran (Haji Ismail Pranoto) - one of the characters Dar al Islam / Indonesian Islamic Army in Central Java. In court, both sentenced to nine years in prison. February 11, 1985, when the case entered an appeal Ba'asyir and Sungkar under house arrest, then that Bashir and Abdullah Sungkar fled to Malaysia. Solo of them cross into Malaysia via Medan. According to the U.S. government, at the time in Malaysia that Bashir establish a radical Islamic movement, Jemaah Islamiyah, who was associated with Al-Qaeda. 1985-1999, Baasyir activities in Singapore and Malaysia is "present Islam to the Muslim community based on Al Quran and Hadith", which is done once a month in a forum, which takes only a few hours there. According to him, he did not form any organization or Islamic movements. But the government of the United States enter the name Bashir as one of the terrorists since the establishment of the Islamic movement that is Jemaah Islamiyah, linked to Al-Qaeda network. 1999, returning from Malaysia, Bashir directly involved in the organization of the Indonesian Mujahidin Council (MMI), which is one of the Organization of Islamic hard-line new. The organization is committed to enforcing Islamic Sharia in Indonesia. January 10, 2002, Chief State Prosecutor (Kejari) Sukoharjo, Muljadji said that it will immediately execute the decision of the Supreme Court against the supreme leader of the Indonesian Mujahidin Council (MMI) Abu Bakar Bashir. To that end, Kejari will immediately coordinate with the Police and Kodim Sukoharjo. January 25, 2002, Abu Bakar Bashir calls for a clarification meeting at Police Headquarters. Abu Bakr came to the House Intelligence Directorate in Jakarta at around 9:30. At the press conference, Abu Bakar Bashir lawyer, Achmad Michdan said Abu Bakar Bashir by calling the Police Headquarters was not part of an effort to check the Interpol Abu Bakr. "Call it a clarification and protection of citizens," said Ahmad. February 28, 2002, Singapore's Senior Minister, Lee Kuan Yew, said Indonesia, particularly the city of Solo as a terrorist. One of the terrorist Abu Bakar Bashir is the Chairman of the Indonesian Mujahidin Council, which is also known as a member of Jemaah Islamiyah. 19 April 2002, Bashir refused to execute the decision of the Supreme Court (MA), to undergo criminal penalties for nine years on him, in case of rejection of the principle of Pancasila as a single in 1982. Ba'asyir regard, the United States was behind the execution of the decision that it was outdated. 20 April 2002, Bashir asked for legal protection to the government if forced to undergo the punishment fit the decision MA 1985. Therefore, the legal basis for the judgment of Bashir, the Law on Combating Criminal Acts 11/PNPS/1963 Subversion now no longer valid and the government had already given amnesty and pardon to prisoners and political prisoners (prisoners / detainees). 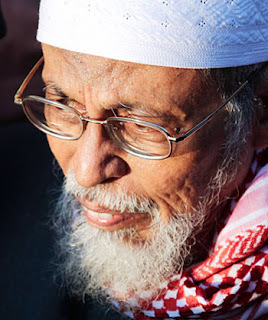 April 2002, the Government is still considering going to give amnesty to the Indonesian Mujahidin Council leader Abu Bakar Bashir KH, who was sentenced in 1985 for nine years by the Supreme Court (MA) as it is considered a crime of subversion reject the sole basis of Pancasila. Of checking the Minister of Justice and Human Rights (Minister of Justice and Human Rights) Yusril Ihza Mahendra, was Ba'asyir did not include political prisoners / prisoners (prisoners / detainees) who obtained amnesty and abolition in the reign of President Habibie and Abdurrahman Wahid. May 8, 2002, the Attorney General's Office (AGO) has finally decided not to carry out the execution of Abu Bakar Bashir against the decision of the Supreme Court (MA) to undergo a criminal penalty for nine years in prison. The reason, basic execution, the Act (Act) No. 11 / PNPS/1963 of subversion has been revoked and the violation of human rights (human rights). Instead, Attorney General recommends to the Chief Prosecutor's Sukoharjo (Central Java) to ask for amnesty for Bashir to President Megawati Sukarnoputri. August 8, 2002, the Organization of the Indonesian Mujahidin Council held a congress in Yogyakarta I to form the leadership of the Mujahideen. Ustad Abu Bakar Bashir elected as temporary chairman of the Mujahideen. 19 September 2002, Bashir flew to Medan and Banjarmasin to speak. From there, he returned to teaching in pesantren Ngruki. 23 September 2002, TIME magazine wrote the news under the title Confessions of an Al Qaeda Terrorist in which he claims that Abu Bakar Bashir touted as a planner at the Istiqlal Mosque bombing. Time suspect Ba'asyir as part of an international terrorist network operating in Indonesia. TIME quotes from CIA documents, writes that the spiritual leader of Jemaah Islamiyah, Abu Bakar Bashir "is involved in various plots." This recognition by Omar Al-Faruq, a young 31-year-old Yemeni who was arrested in Bogor last June and sent to an air base in Bagram, Afghanistan, the U.S. occupied. After several months of silence, Al-Faruq finally issued a confession - the CIA - that rocked. Not only claiming to be Al-Qaeda operator in Southeast Asia, he claimed to have close ties to Abu Bakar Bashir. According to intelligence reports, combined with Time magazine investigation, even Ba'asyir is the spiritual leader of Jemaah Islamiyah who aspire to establish an Islamic state in Southeast Asia. Bashir is accused of supplying also the people to support the movement of Faruq. Bashir called the people behind the Istiqlal Mosque bombing in 1999. In the September 23 issue of the magazine, Al-Farouq also admitted his involvement as the mastermind of a series of bombings, December 24, 2000. 25 September 2002, In a special interview with reporters TEMPO, Bashir said that while in Malaysia it does not form any organization or Islamic movements. While there he and Abdullah Sungkar only teaches preaching and teaching the Sunnah of the Prophet. "I have not joined in politics. A month or two months I've also come to Singapore. We are teaching jihad, and was among those who strive to the Philippines or Afghanistan. All personal nature." He said. October 1, 2002, Abu Bakar Bashir in connection with the complaint TIME Magazine story written in the magazine dated 23 September 2002, according to Bashir's news included in the trial by the press and resulted in the pollution of his good name. Bashir denies all the allegations reported by TIME Magazine. He also pleaded not familiar with Al-Farouq. October 11, 2002, Chairman of the Indonesian Mujahidin Council Abu Bakar Ba `asyir asked the government to bring Omar Al-Faruq in Indonesia related to the confession that said that she knew Bashir. On the basis of saying U.S. charges of involvement with Al-Farouq Al-Qaeda network and terrorist actions by the CIA did in Indonesia, Bashir said that it is appropriate that Al-Farouq was taken and examined in Indonesia. October 14, 2002, Bashir held a press conference at the Pondok Al-Islam, Solo. In a press conference he said the incident was the explosion in Bali is an attempt to prove the United States during this tudingannya that Indonesia is a terrorist. October 17, 2002, the National Police Headquarters has sent a summons for the suspect to the Indonesian Mujahidin Council leader Abu Bakar Ba `asyir. However, Bashir does not meet the Police Headquarters to call to testify about the good defamation committed by TIME magazine. October 18, 2002, Bashir established by the Police suspect Omar Al Faruq following the recognition of the Teams in the Afghan National Police as well as one of the suspects in the Bali bombings. March 3, 2005, Bashir was convicted of conspiracy to bomb attacks in 2002, but not guilty to charges related to the 2003 bombing. He was sentenced to 2.6 years in prison. August 17, 2005, the detention period reduced Ba'asyir 4 months and 15 days. This is a tradition in Indonesia's Independence Day. He was released on June 14, 2006. August 9, 2010 Abu Bakar Bashir was arrested by the Police back in Banjar Patroman on charges of patronizing a branch of Al Qaeda in Aceh. June 16, 2011, Bashir was sentenced to 15 years by a panel of judges in South Jakarta District Court after being involved in financing terrorist training in Aceh and supporting terrorism in Indonesia, despite the many controversies that occurred during the trial.